It's been a weird week around here. Hunter only had school on Monday and Tuesday. No, we did not have snow... it was teacher conference time. Here in Kansas the kids get a day or two off for parent teacher conferences. Kind of weird, huh?! We went to church on Saturday night so we could have a picnic lunch at the zoo on Sunday! It was beautiful outside! We had so much fun! We love our little ballerina! Tuesday morning we did a little Frozen floor painting. Wednesday night was crazy... I had to take Maggie to a birthday party. Ben took the boys to AWANA. Then we met at Hunter's school to visit with his teacher. After our meeting we split up again to pick up the kids. We ending our evening with books! Love my big boys! 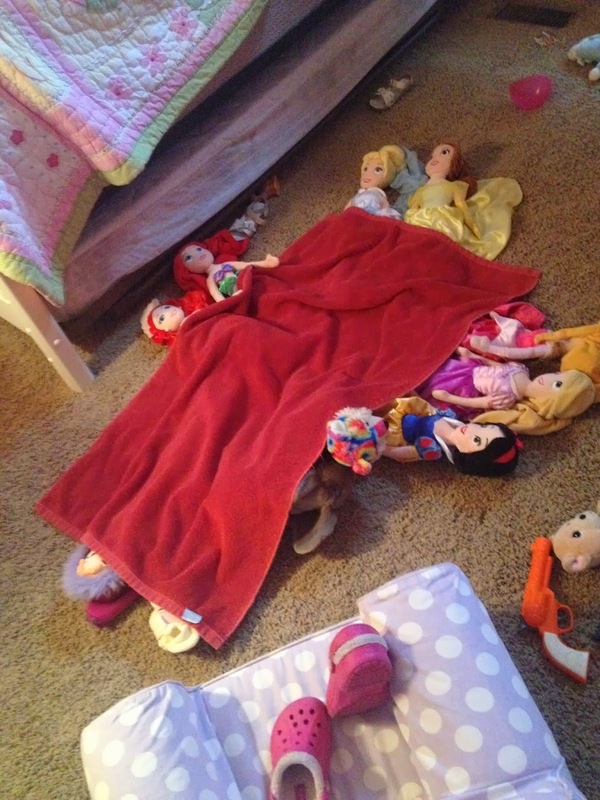 Maggie must have gotten up in the middle of the night to tuck in her princesses on Wednesday night! I came in to check on her on Thursday morning to this... :) Love her! Thursday afternoon we had a lot of fun playing! We played lots of games, a little hide-n-seek, painted, road plasma cars and watched Archer's favorite movie, Wreck it Ralph! So much fun!! Watching a little Disney Junior before we head to church for MAPS. I love Fridays! !